Are you one of those employees who love to steal a little time off from work to check your Facebook account, shop on eBay or even blog and chat with a friend or two on YM? I remember when I was still working at my last job and I was guilty of the same thing. FB was not the hottest craze back then but YM was so I used to log in to YM daily just to keep things alive when work gets too dull to bear. I think almost everyone cheats a little at work and though it sounds harmless enough, the reality isn't so. Nowadays, employers have the ability to monitor their employees every move ... online that is! Thanks to new technology and Keylogger methods, your employer can easily monitor your online activities. And if you happen to be under the reins of a strict boss, you might just be reprimanded for wasting company time with your FB, blogging or chatting activities during office hours! 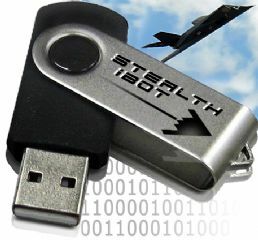 Have you heard of the Stealth iBot Computer Spying Tool? This is how it looks like and it works by secretly capturing passwords, chats, screenshots and more of your online activities. After inserting the USB, in just 5 seconds this little device will start monitoring all computer activity on all user accounts. It works with all PCs and laptops and it also has the ability to store up to 10,000 screenshots and virtually unlimited text! Sounds pretty scary to me if this little device can detect your password but in some cases this item actually comes in handy. Like if you have children at home; then your purpose to monitor their online activities is sufficiently justified. After all, how many times have we read horror stories on little children being lured from their homes and eventually kidnapped, brutally murdered after befriending a stranger online? Anyway, it's great that I'm working from home and I have no superior or power-crazy authority hovering and watching my every move with extra strict surveillance. The freedom and trust to be on my own actually gives me the boost and drive to be even more productive in what I do. So it's all good for me here inside my home-office. In fact, I've just completed a job for a client, and now I have a little free time to enjoy. Perhaps I'll log in to my FB account or look up somebody on YM for a little chat. After all, I have no boss to answer to and no worries about wasting company time! Thanks for reading and have a wonderful Tuesday! yeay to being our own boss.. yahoo.. I am glad it's just me too....although, we have an FBI clearance for Walter's job and I swear some times my phone is tapped!! Ohhh! Sounds like me Sweetie! I am at work now, LOL! Hi! I am in the office, he he he.... stealing time to come here since at home always struggling for lines. I did not read your whole articles yet bur I have some ideas of what you put forward since I read the beginning. I am in the midst of typing salary slips, then got to type a letter to the bank and to follow up preparing some docs for Immigration re visas for another 6 Arab staff, blah, blah..
By the way, mau tak mau I rescued 3 kittens already while in KL. Altog. I have 10 of my own, Coco died still cannot get over it, Snow White went missing and 3 Terengganu cats, mine bal 10, so altog. 13 adult cats and 3 kittens living in an apartment, can u imagine. Will post the story in FF soon. Everyday or night I have to mop with Ajax nice fragrant at the front living and the cats' room (Cat hotel lah - Master Bed room sacrifice for them tau!) cerita kucing memang tak akan habis because I tak sampai hati if I see injured and hungry kittens especially. Ha ha ha who isn’t nowadays right? Too many things going on online to miss, even during office hours lol!